While mushroom caps stuffed with a hearty shepherd’s pie filling, topped with mashed potatoes and Irish cheddar cheese was inspired by St. Patrick’s Day, it’s not really one of my celebrated holidays. I’m not one to run out and make a bunch of green colored food, especially if the green color does not occur naturally. PLUS, I’d never, ever drink green beer (shuddering). My fondest memory of this day was cutting school when I went to Brooklyn Tech with my ne’er-do-well friends, buying beers, going to the parade and hanging out in Central Park with the rest of the revelers. Strange behavior, since I was pretty much a good student and I NEVER drank beer. I may have pretended to drink one that day, just to fit in with the “cool” kids. The day was fraught with feigned “drunken” adventure and the risk of getting caught. At fifteen, it was a good time. My current St. Patricks Day behavior consists of hiding and trying to avoid the post-parade drunks and the “Irish for a Day” bar crawlers that descend on New York City every year. I envisioned myself singing “Danny Boy” and pondered what to make when I decided to join the Google+ food blogger community and do a Google+ live-on-air hangout cooking demo for St. Patrick’s Day. The shepherd’s pie stuffed mushrooms came to me like a revelation. I decided that it really fit for St. Patrick’s Day for two reasons. My first thought of a St. Patrick’s Day dish was naturally corned beef and cabbage. It’s the go-to dish for the holiday, but it’s not actually a traditional Irish dish. It’s an Irish American invention. Apparently, native Irish have a good laugh that we’ve made this dish synonymous with St. Paddy’s Day, since they don’t eat it. Shepherds pie, on the other hand, is a very traditional Irish dish, from the 1800s, according to Wikipedia (so it must be true). Secondly, shepherd’s pie stuffed mushrooms are heavy on potatoes. No one likes drunken guests—tipsy, but not tipping is my ideal. I keep this delicate balance by feeding my guests foods that are heavy on carbohydrates. 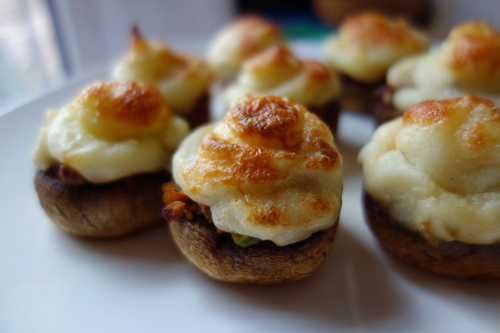 These stuffed mushrooms are substantial and more-ish appetizer that will help keep them upright. Shepherd’s pie was originally called cottage pie. Some folks believe that it’s only shepherds pie if made with lamb and cottage pie is made with beef. I’ve also read where you can make it with any kind of meat and still call it Shepherds Pie. The truth is so subjective. For me, it all comes down to branding. I preferred the ring of “shepherds pie stuffed mushrooms” to “cottage pie stuffed mushrooms”, so that’s the name for my St. Patrick’s Day-ish dish. I’m pretty sure that no matter what you call it, you’re going to call it delicious. If you’re feeling more festive than me, you can dye the mashed potatoes green with food coloring. To color them naturally, I’d steep some chopped parsley in hot water, squeeze out the liquid and use that to dye the potatoes. Brown ground beef in a medium skillet, over medium heat. Strain beef from the fat and return the fat to the pan. If needed, add enough olive oil to make one tablespoon of fat in the skillet and return to medium heat, Add onions and garlic to the pan and sautee them until they are translucent. Add celery, carrots, parsnips and turnips and sauté until tender. Add reserved ground beef, tomato paste, thyme, peas and stock to the skillet. Season to taste with salt and pepper. Cook filling until the liquids evaporate, stirring occasionally. Remove from heat and cool. Cover potatoes with cold water in a medium-size saucepan, bring to a boil and cook until tender. Remove from heat, drain and return the potatoes to the pan. Add half-and-half and butter to warm potatoes. Using a potato masher gently mash potatoes until smooth and creamy. Season with salt and pepper to taste. Cool potatoes for 20 minutes. Remove the stems from the mushrooms and reserve for another purpose (see note). Trim the edges of the mushroom caps to make more room for the filling. I did this by using a paring knife to just cut the ridge off the mushrooms. Be careful not to cut away too much of the edge so that you still have a cup-like shape that will hold the filling. Prepare a baking tray by spraying or brushing with olive oil. Place mushroom caps on the baking tray and spray or lightly brush with olive oil. You are using a brush make sure you brush the bottoms of the mushrooms as well. Fill mushroom cups with shepherds pie filling with a teaspoon, pressing the filling in gently, taking care not to break the mushroom. Filling should be level with the top edge of the mushroom. Do not overfill or mound the filling. Pipe potatoes over the shepherds pie filling, in the mushrooms, starting from the outside, in circles, until you get to the center. Sprinkle the top of each mushrooms with grated cheese (about a 1/2 to 1 teaspoon). Press cheese gently so it sticks to the mashed potatoes. Bake until the cheese is golden brown, about 20 minutes. Makes 20 - 24 stuffed mushrooms depending on the size of your mushrooms. I drew this illustration of the Shepherds Pie Stuffed Mushrooms for my G+ Hangout On Air Demo events page because I made the recipe for the first time live during the demo and I did not have an actual picture of the finished dish. I realize now that I should’ve made it more golden cheesy looking on top. The photo I took of the finished dish was taken with my new Sony RX 100 camera! I’m making Shepherd’s Pie Stuffed Mushrooms, a hearty appetizer to keep the “Irish for a Day” folks upright on St. Paddy’s Day! 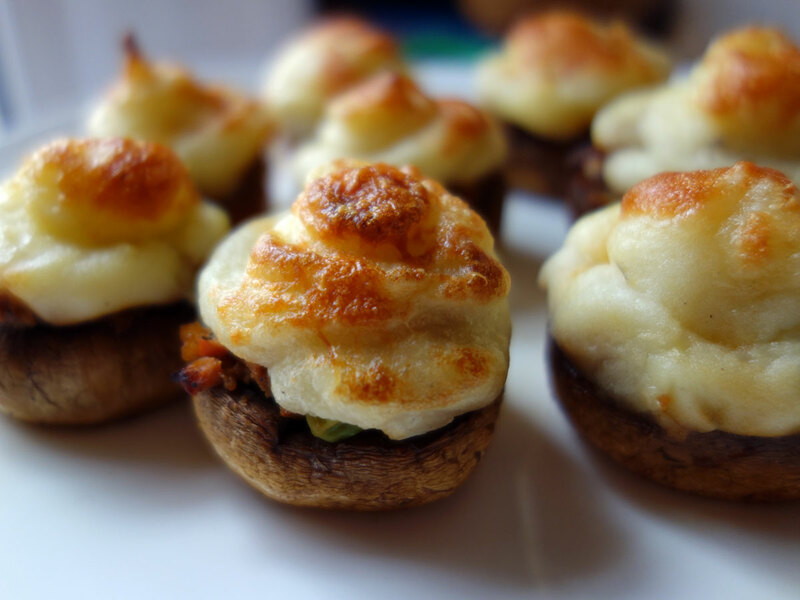 Okay, some people will call them “cottage pie stuffed mushrooms.” I just call them “delicious”!